What are Reorder Trigger Points? A product's reorder trigger point is the level of inventory which triggers an action to replenish that product's stock. It is the minimum amount of the product in your store, such that, when stock falls to this amount, the item should be reordered ( Paraphrased from Wikipedia). You may add reorder points to your products by editing them directly in the Bindo App, on the Bindo Dashboard, or via an inventory import. If you'd like to add reorder points to many products simultaneously it is recommended that you do so through an inventory import. 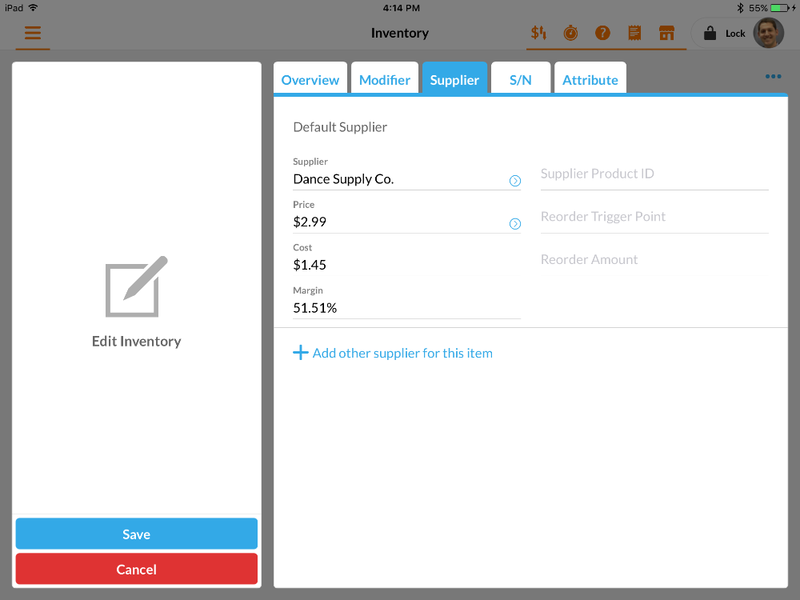 To add a reorder point to a single product via the Bindo App navigate to the Inventory page, locate the product you'd like to edit, tap on the three blue dots and tap "Edit". Then tap on the "Supplier" tab. Note that in order to add a Reorder Trigger Point to a product you must first associate that product with a specific supplier. Once the product is associated with a Supplier, you will be able to enter values into the "Reorder Trigger Point" and "Reorder Amount" fields. Tap on the "Reorder Trigger Point" and "Reorder Amount" fields and enter a number in each to set a value. Note that you have the option to add a reorder point for each supplier that is associated with a product (may apply if you purchase a product from multiple suppliers). Tap "Save" to finish. You may also add this information from the Bindo Dashboard. To do this from the Dashboard click on "Inventory" on the left side menu, locate the product that you want to edit, click on that product and click on the "Supplier" tab. As noted above you must associate the product with a Supplier in order to add a reorder trigger point or reorder amount. If there is no supplier associated with the product click the "Edit Supplier" button, then the "Add Supplier" button, then add the relevant information and Save your changes. What Should I Set as my Reorder Trigger Point / Reorder Amount? If you're not sure about what value to set as the reorder trigger point, it might be helpful to think about it using the following sentence: "When I have less than _________ units on hand of this product I want to order more stock". Whatever the number is that you fill in the blank should be your reorder trigger point. You may add a reorder trigger point without adding a reorder amount, but the reorder amount could be helpful. If you're not sure about what to set as the reorder amount it might be helpful to think about it using the following sentence: "When I have less than the value I set as my reorder trigger point I want to order _________ units of this product". Whatever the number is that you fill in the blank should be your reorder amount. Don't worry if you are not sure about these values, since Bindo does not automatically place reorders on your behalf you'll always be able to adjust purchase order quantities before placing an actual order. There are several ways that you can identify that an item's current on hand quantity is below its reorder trigger point value, and thus is due for a reorder. 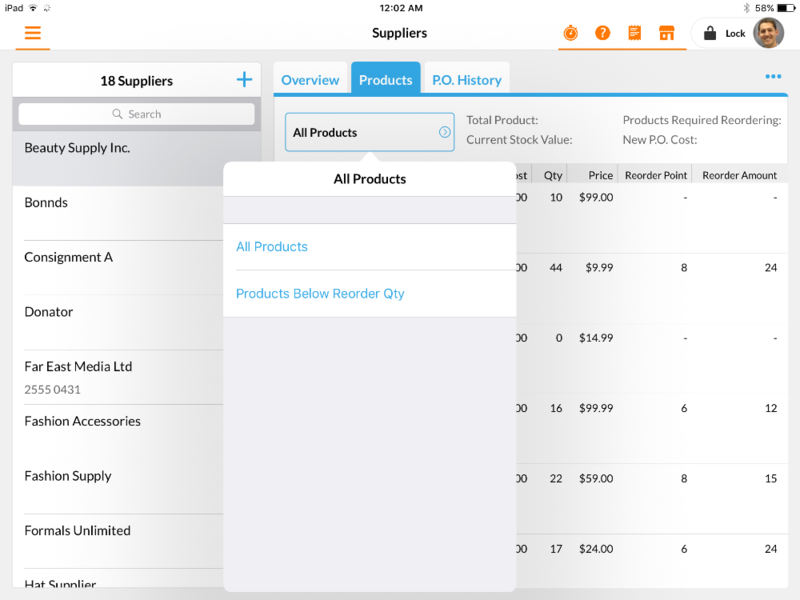 Filter on the Suppliers Page in the Bindo App: Navigate to the Suppliers page, tap on the "Products" tab, then tap on the button that says "All Products". In the dropdown that appears tap on "Products Below Reorder Qty". This adds a filter that shows only products that are due for reorder based on the Current On Hand Qty being less than or equal to the Reorder Trigger Point. Both of these values show on the page. To create a purchase order for these items tap on the three blue dots in the top right corner and tap "Generate Purchase Order" to automatically add the products that are due for reorder to a Purchase Order. Create a new Purchase Order in the Bindo App: Navigate to the Purchase Orders page, tap on the "+" sign, tap on the "Select Supplier" box, and add your supplier. 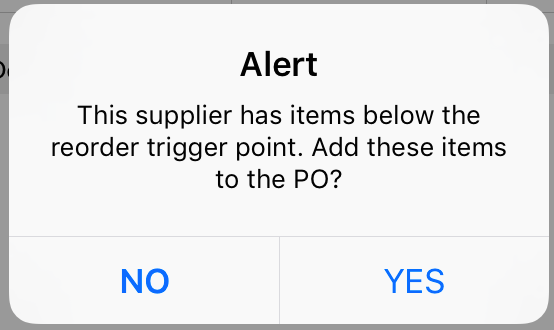 If the current stock level for any product that you purchase from this supplier is below the reorder trigger point for that product the below alert will appear. Tap "Yes" to automatically add the products that are due for reorder to a Purchase Order. For the above options if you've set a Reorder Amount for a product the quantity added to the Purchase Order will be pre-set to that Reorder, otherwise the quantity will be zero and you may edit it on the Purchase Order directly. You also have the option to delete an item from the Purchase Order if you prefer to not order it. To edit or delete an item tap on the item in the draft Purchase Order and either adjust quantity in the Quantity field, or tap on the Trash Can icon to remove the item. Open the exported file using Microsoft Excel or Google Sheets. Scroll all the way to the right and find the first blank column (column AC). Add the following formula into the column AC starting in row two: =IF(AND(W2>0,K2<=W2),1,0) (copy and paste this exactly as is). This formula will check the current on hand quantity against the reorder trigger point. If the item in the row you're checking should be ordered the cell will display 1, otherwise the cell will display 0. Copy the formula down to all cells. Highlight all rows of your spreadsheet and Sort by Column X in Descending order. This sort will separate the items that are due for reorder from other products. All of the products that show with a 1 in Column X should now be at the top of your spreadsheet. Based on their current stock level and their Reorder Trigger Point each is due for a reorder.